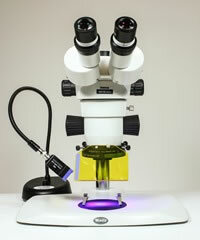 The NIGHTSEA™ Stereo Microscope Fluorescence Adapter system (SFA) is a complete solution for adapting existing stereo microscopes to visualize fluorescence. It includes everything you need for adapting (not converting) just about any stereo microscope, including light sources and matching barrier filters. It is a modular system, so you can purchase the wavelength combinations that you need now and add more at any time. We now offer 6 excitation/emission combinations and add more as we can. What are some high points? This video is a quick (2:39 min) introduction to the system, showing you the components and how quick and easy it is to add them to a microscope. What wavelength sets do you offer? Can I really see anything at that price? The proof is in the image. The images here and in the galleries linked below were all made using the system in conjunction with a conventional stereo microscope. Who is purchasing these systems? What do users say about the system? Read some testimonials and the reviews at SelectScience. What are some applications that people are using this for? Do you offer any accessories to make this even more versatile? With the combination of the SFA, your stereo microscope, and these accessories you can truly do Fluorescence Everywhere™. You are no longer tied to the laboratory bench.